The Sweet Child o’ Mine electric guitar lesson is a huge lesson jam packed with information that you must known, no matter whether you are into hard rock or not. You will learn many things related to lead guitar techniques, so don’t neglect this lesson! The lesson starts off with the super famous intro riff, which is based on the minor scale and is a great string skipping exercise. The minor scale is a very important scale that you’ll eventually be using to improvise and make up your own licks and solos, just like Slash does in the song. You’ll also get a chance to practice power chords and power chord strumming and string muting, which is not the easiest technique, but is a must know if you are serious about learning to play the guitar well. To sum it up, this lesson will greatly improve your lead guitar skills, as you’ll be practicing basically every lead guitar technique there is. 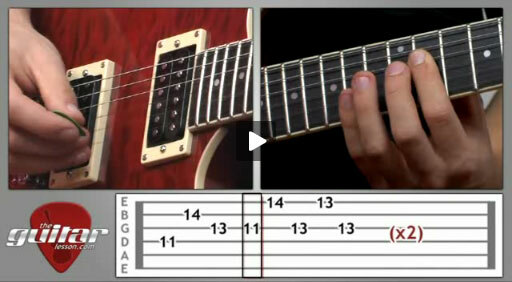 If you're an absolute beginner, you might find this lesson a bit challenging. Don't worry, you'll get there soon, have a go at one of ourbeginner guitar lessons until then. Sweet Child o' Mine" by the Guns N' Roses was released on their debut album Appetite for Destruction in 1987. It became a number-one single on the Billboard Hot 100 in 1988. The subject of the song is Axl Rose's girlfriend, Erin Everly. The famous intro riff was made up by the band’s lead guitarist, Slash. It’s played on one scale, and supposedly he made it up just by fooling around on the scale to his fellow band members at a jam session. The result of this was that the song brought the band international fame, as well as top of the chart listings. The song has been covered by many artists, including Sheryl Crow, Linkin Park, etc. Sorry, but you've reached a premium content area. The download of the Sweet Child o’ Mine tablature file is only available to premium members. Sorry, the same goes for the backing track. To download the backing track to Sweet Child o’ Mine, please log in and revisit this page.